We have discussed above the effect on consumer’s equilibrium of a change in consumer.s income, relative of commodities remaining the same. Now lei us see the effect of a change in relative prices. consumer’s income remaining the same. This leads us to the study of what is known as the Substitution Effect. 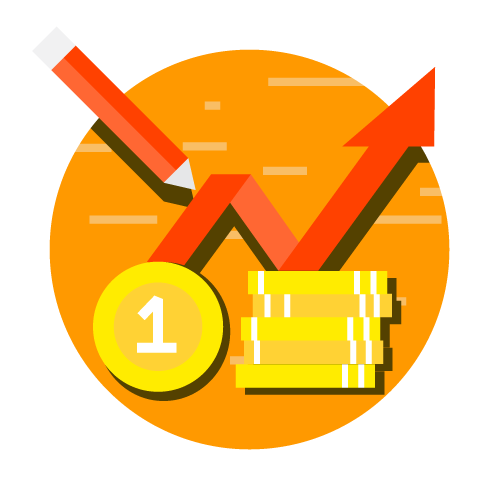 Substitution effect means the change in the quantity of a good purchased which is due only to the change in relative prices, money income remaining constant. When prices of a good, say, X, falls, real income of the consumer would increase. In order to find out the change in the quantity of X purchased. 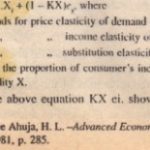 which is ,attributable only to the change in the relative price of X, the consumer’s money must be reduced by an amount so as to cancel out the gain in real income that results from price decrease. This is necessary for us to know the effect of only a change in relative prices, consumer’s income remaining the same. 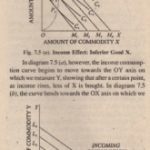 The amount by which the money income is reduced, so that the consumer should be neither better off nor worse off than before (i.e his income remains the same), is called Compensating Variation in Income. 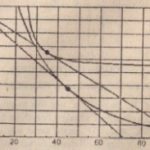 The substitution effect can be explained easily with the help of Fig. 7.6 given on this page. 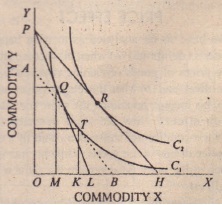 In this Fig., the consumer is in equilibrium at point Q where the given price is PL is tangent to indifference curve CI’ When the price of X falls, while the price of Y remains the same, the price line will shift to PH (because now more of X is purchased) and the consumer will be in equilibrium at R, where the new price line PH touches the indifference curve Cz. To find out the substitution effect, we draw a hypothetical price line AB parallel to the price line PH so that it ti.e., An) should touch the indifference cuve CI’ Slope of AI3 or PH shows tile changed relative prices of X and Y. In terms of this diagram, BH or AP is the amount of money income that should be taken away from the Consumerism so that the gain in real income which results from the fall in the price of X is cancelled out. 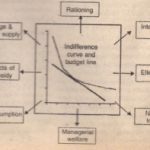 With price line AD, the consumer is in equilibriumat T on indifference curve CI. At the point T, he gets the same satisfaction as at Q, because both Q and T :uc situated on tile same indifference curve CI. Movement from Q to T on the same indifference curve C I is due only to the relative fall in the price of X. At the point T, the consumer buys MK more (at Q he bought OM but at T he buys OK) of X than at Q as X is not relatively cheaper. This MK is the substitution effect which involves movement from Q to T.